Title: Now working for the Norfolk Southern, this pair of ex-Conrail EMD SD-40-2's have ran this route many times before. They will shove this boxcar freight west to Conemaugh and then cut off. 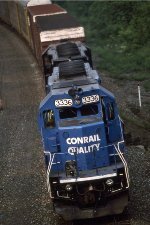 Description: Note the difference in the CONRAIL logos. Description: The first helper on this loaded coal train was the 3336, still in Conrail Quality paint. 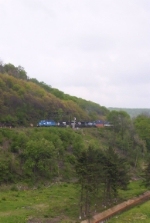 Description: A SD40-2 helper set heads west through Cresson. Description: A quartet of helpers assist this eastbound loaded coal train down the mountain. Up front are three SD40-2s, so this train had a total of seven SD40-2s!